Why theater? : Because had I written a screenplay I wouldn't know one thing to do with it. But if I'd written a play, I would know at least 10 things I could do to get it produced or performed. Tell us about The Legend of Julie Taymor: It's a crazy rock musical about archetypes everyone knows and loves. An egotist director, a clueless rockstar, scheming producers. Spider-Man is just a gimmick, the musical is very strong standalone, with great narrative arcs and a stunning score. What inspired you to write The Legend of Julie Taymor? : Well during the time when Spider-Man was on haitus, I read this New York magazine cover that depicted Julie, Bono, and Michael Riedel as comic book characters. I thought, "That would be an interesting comic book!" 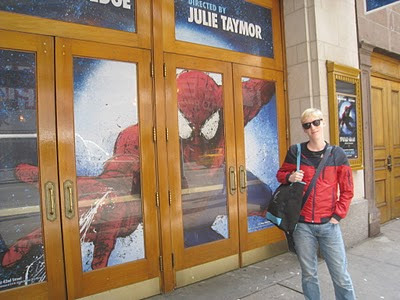 but I quickly imagined it would be an amazing musical, much better than the actual Spider-Man. I read the article and it was all about the financial problems (the show had not began performing on Broadway) I thought the show could be just like the producers, only the producers are more ego-maniacs. How does it feel poking fun at one of the most topical stories in theater? : Well, it's fun and exciting that the show has been so popular, I'm grateful for the success we've had. I never felt threatened by parodying powerful figures in Broadway. In fact, most of the producers of Spider-Man bought tickets to our show. I've been in talks with Michael Riedel and he is very supportive, and even wanted to participate with us. What kind of theater speaks to you? What or who inspires you as an artist? : I like theatre that really, truly takes the audience to another world entirely. I think those are the most effective shows, and often the most successful. Using Phantom of the Opera as an example, the score and every aspect of the physical production is entirely transportive. You forget where and when you are. Sweeney is like that, my favorite musical. Who would play you in a movie about yourself and what would it be called? : Oh golly. I don't know. Let's say Alan Rickman playing a 24 year old mumbling under his breath and speaking in nothing but sarcasm. The film would be called, "Gola presents: Travis Super Confetti Sparkle Magical Shark Adventure Picture Show." What’s your biggest guilty pleasure? : Ask anyone who knows me. Milkshakes. Milkshakes from Shake Shack or Lucky's are my fave, although The Burger Joint, and Wendy's Frostee's are good too. If you could work with anyone you’ve yet to work with, who would it be? : I want to work with Sutton Foster. Who doesn't? The question should be, "Who will you have to work with before you can feel like your life is complete?" Of course this is all contingent on whether she can still do the splits in the future. What show have you recommended to your friends? : The Toxic Avenger, so glad it's coming to Broadway. I also recommended The Scottsboro Boys, which should have won the Tony for Best Musical over The Book of Mormon. How can anyone argue the The Book of Mormon score is better than Scottsboro? What emotions does the Book of Mormon score evoke but one? What’s up next? : Well, believe it or not, I'm beginning a few projects that are much more serious and personal than Legend of Julie. I actually prefer to write more serious pieces, but I wrote Legend so as to just get a lot of press and publicity very quickly and kickstart my career. Now I'm taking that momentum and turning it into what really matters to me, my next projects. Can't reveal much, but you can be assured I like black comedies, and modern day tragedies of Greek proportions.